A blend of cold-pressed vegetable oils processed from organic and naturally grown plants. Left free from any aroma and ready to mix with the concentrated aroma of an essential oil. Most essential oils are too strong to be applied directly to the skin: some could cause serious burns. 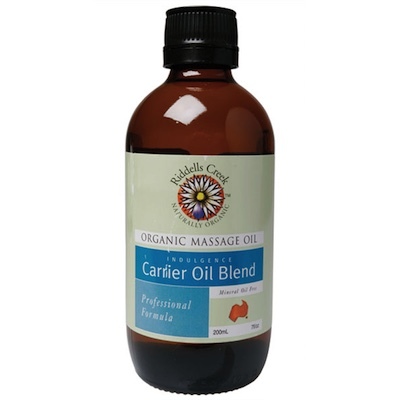 So when using essential oils for aromatherapy purposes, you can mix drops of the concentrated essential oil into this carrier oil blend to make a suitable, diluted mix. Add a few drops of essential oil (or oils) directly to the bottle or pour a small amount into other container before adding essential oils. Enjoy! Organic Safflower Oil, Biodynamic Macadamia Oil, Biodynamic Avocado Oil, Sunflower Oil, Rosemary Extract, Jojoba Oil, Sweet Almond Oil, Wheatgerm Oil, Grape Seed Extract.